I have avoided @steemmonsters up to now as i didn't want to spend the money on it. Is it possible to start and enjoy playing just with the starter pack, or would I have to buy lots of booster packs also? Have I left it too late to get in the game? NO you have not left it too late, you have added some cost by not getting in earlier. The starter pack will cost 10 usd After that you do not need to purchase any cards. You do need to get a starter pack, as game play does not activate unless your account has purchased a starter pack. Once you get the pack you will need a few more cards yes. Buying these cards through booster packs can become expensive. Some of the cards you will need will be available on the market. at a cheaper price than buying a booster pack, These are obviously the less valuable cards, but they are needed for some battles. A booster pack costs 2 usd. You get 5 cards in a pack, that is an average of 0.40c usd a card. On the market some of these cards can be purchased at a lower cost. Some as low as 0.11c usd. The rarer cards and more desirable cards are more expensive and they do go up in price. You can gain a decent deck to begin with just 12 usd. Getting a starter pack and buying some loose cards off the market, Boosting one splinter. The game itself does offer opportunities to gain extra cards through games using a ranking system and a quest system. I myself is a free2play SteemMonster player. I only bought the Starter Pack and at least 1 Booster pack but still managed to climb my way to the GOLD league. 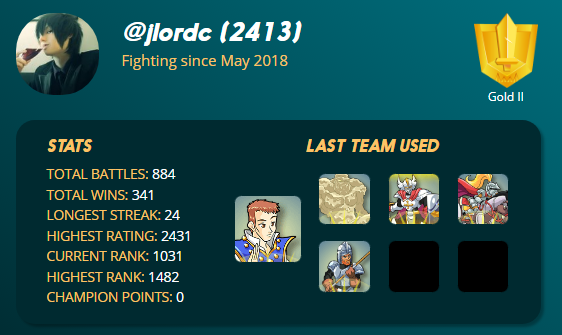 The image above might show that I have been fighting since May 2018 but honestly I just came back this month after they released their "Daily Quests" feature. So again, you are not lateeee! Completing the Daily Quest allows one to gain 1 Booster Pack daily increasing the number of cards you have. Yes, it's possible to play with just buying the starter pack. You don't need to buy a lot of booster packs because there's a daily mission every day which awards you with 1 free booster pack every time you finish it. So, players with starter pack can improve their deck without buying booster cards at all. No, it's not too late to get in the game right now. Log on and start battling with the cards you have. You can win free card packs just by playing. Why would a guy act like he loves you today and Give you attitude the next day?If i delegate my some of Sp to someone then after sometime i want to take back my sp which i delegated to someone how could i take back what is the procedure ?Do you prefer e-books or paper books?Have you seen the movie "Bohemian Rhapsody"? What did you think?Which Are Your Reasons You Would Still Be Active In Musing-io , If Rewards For Participation Are Suspended?What is the best advise that you can give to a person who hates her 8:00-5:00 job?What do atheists and other people who do not believe in a particular god cling to, especially in times of crisis and anguish?What's Your Favorite Brand Of Ice Cream & Why? ?How musing.io can work/integrate with quora/reddit or to add value to many users outside steemit?How do I record calls on my cell phone? ?